Unlike many anglophones (Brits especially) who move to France we are not of pensionable age, so we needed a way of earning an income. 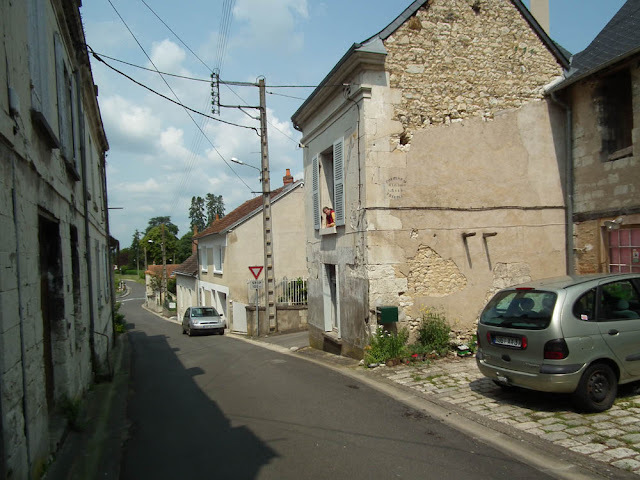 When we moved here our original idea was to live in the graineterie and rent the house out as a gîte (holiday self-catering accommodation). But we soon realised just how many people were doing that and that one gîte couldn't give us a livable income. We decided to do something that could link into the tourist industry here, but acting as a complement to the holiday accommodation sector so that we worked as partners (as the French like to call separate but collaborating businesses). 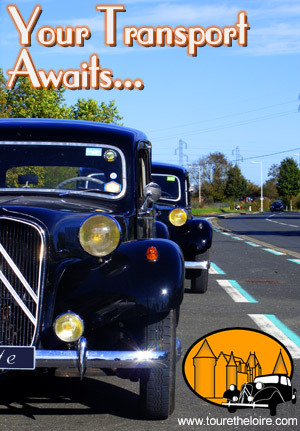 Luckily, some serious periods of thought (and the need to justify having a Traction Avant) bought us to where we are now, and three years in the hard thinking is starting to pay off. We have been extremely lucky with our clients, who have been interesting and interested people, fun to spend the day with, and that makes our work so much easier. 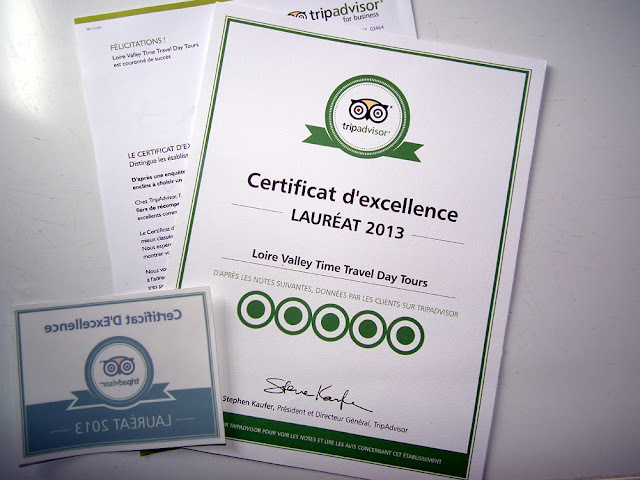 Most of our enquiries about tours come after people have read our reviews on TripAdvisor, who have just awarded us a Certificate of Excellence. It means that we are rated amongst the top 10% of attractions listed on TripAdvisor. This is due to our clients who take the trouble to post a review about us on the popular travel forum. They have consistently rated us as excellent (with one exception out of 33 reviews, who thought we were very good). This is very reassuring: for us in that it shows us we are apparently doing the right thing, as well as for our future clients when they are searching for something special to do in the Loire Valley. You hear a lot of negative things these days about TripAdvisor, and some travellers don't trust the reviews to be genuine. Rumours that fake reviews are written by professionals abound, and we receive many offers from professionals to write more reviews (these hit the spam bin so fast it's a wonder we don't get whiplash). Furthermore, they wield a lot of power, as a single negative review can have a big impact on business. Although we ask our clients to write a review, what they say is entirely up to them and personal to them. Fortunately, the one time we had what looked like a negative review, we realised that the client had mistakenly reviewed us when she had actually used a different group, who have a guide with a similar name. We let TripAdvisor know and they immediately removed the review. What a relief! On the whole, I think TripAdvisor is a useful tool for the canny traveller, who knows what they like and is willing to take the time to read between the lines of other people's reviews. What do you think? Do you use it, and how do you sift the useful information from the irrelevant? One day in April we arrived at the Chateau Gaudrelle winery and were met as usual by their intern Cristina. We asked where Alexandre was, as it is always nice to catch up with the owner if he is around. I'm afraid we just fell about the place. Photo courtesy of Chateau Gaudrelle. What Alexandre was doing was hanging plastic dispensers of a product called RAK® (developed by BASF Crop Protection) on the vines. It allows him to combat the damage caused by Vine Moth caterpillars without resorting to insecticides. By broadcasting a pheromone that matches the chemical attractant produced by the female moths when they want to mate, the males don't know where turn and in their confusion fail to mate. Failure to mate means failure to produce caterpillars. Alexandre says the product is extremely well regarded in the industry. Lecture: As part of the Archaeology Festival de la trace aux gestes there will be a lecture on the Paleolithique population of the southern Touraine. Friday 2 August at the Salle des Fêtes in Preuilly, 6 pm, free (in French). Disconnected! : All the internet connected to Preuilly-sur-Claise's interchange died at 11am on Sunday. Antoinette in Charnizay rang Orange and was told 'Wednesday at the latest'. Yesterday at 17.00 our internet connected but with no access to the world wide web or email. At that stage we had Skype only but hopefully by the time you read this we will be back online properly. Thanks to Alex and Nicole for the access to their wifi over the last couple of days. 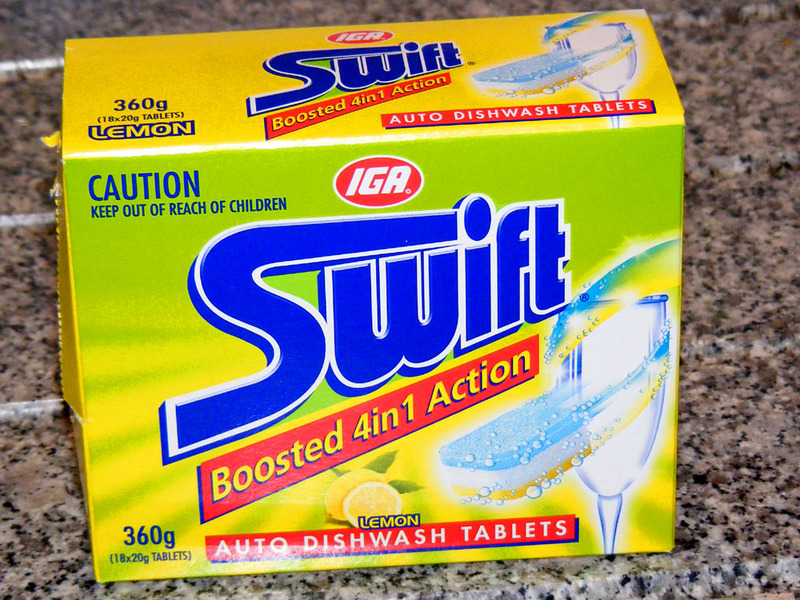 We bought these dishwasher tablets for the bargain price of €1.25 in Leader Price in Chatellerault. Can you spot the anomaly? 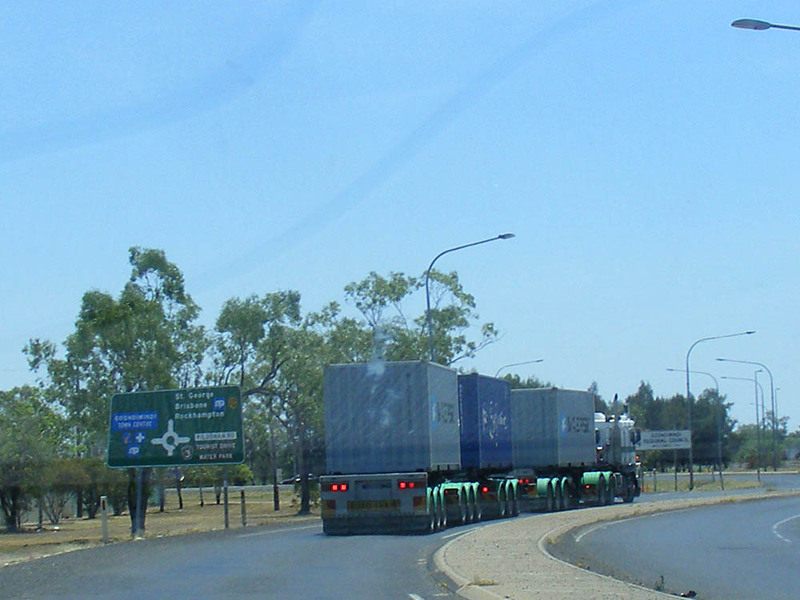 B-Doubles parked on the roadside in Dubbo at lunchtime. 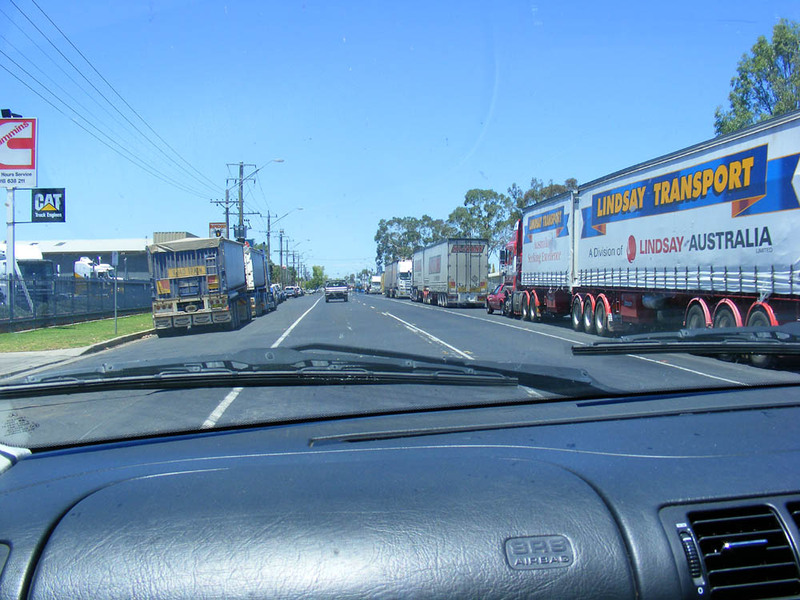 Roadtrains, that is to say, multi-trailered articulated trucks, are a fairly well known Australian phenomenon. In the years that we have been away they have come to dominate the roads as never before. The trucks are getting bigger (now the largest in the world) and they are being allowed ever closer to urbanisation. In Queensland and New South Wales they are limited to 35m long, but in the Northern Territory they can be 55m long. A roadtrain of the type known as a triple. We followed him out of Goondiwindi on the Queensland / New South Wales border and later encountered him creeping along at walking speed with one of his many wheels on fire. 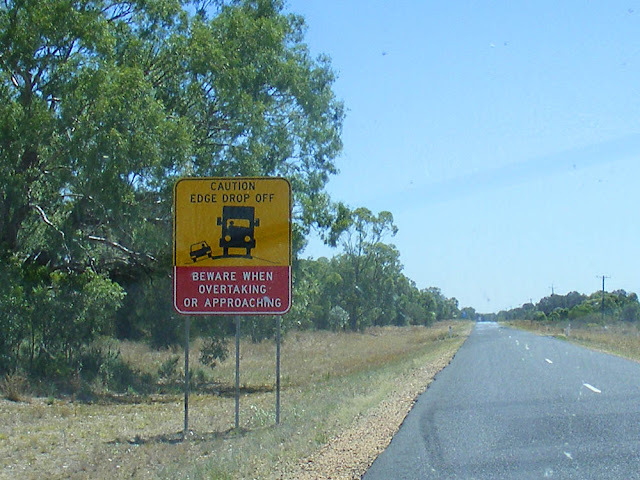 Surprisingly, this makes driving these roads a very pleasant experience (if you discount having to spot emus, kangaroos, feral pigs and goats or domestic sheep and cattle with a death wish on unfenced roads). Everyone just puts on their speed limiter or cruise control and hums along for kilometre after kilometre. This is in complete contrast to the insanely hyper city driving in Australia. We nearly got collected in Canberra because we stopped for a red light -- the car behind us had to swerve wildly and dash through. Clearly it is considered ridiculous to stop unless the light has been red for some seconds. Everyone drives with their foot flat to the floor, alternating between accelerator and brake. 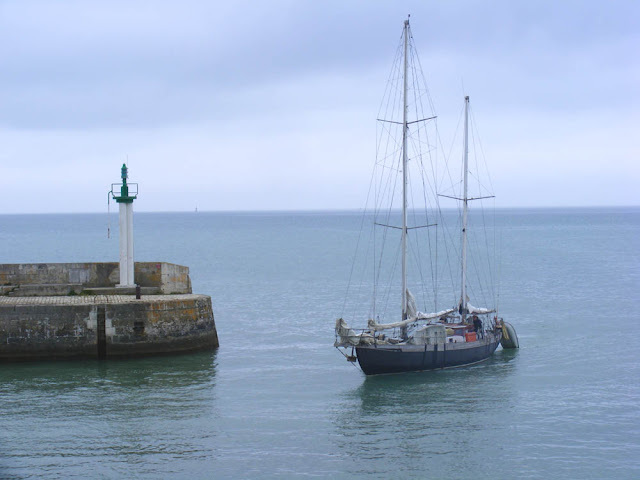 Ile de Ré Reflections: A ketch glides into the harbour at Saint-Martin-de-Ré, almost silent its motor was so quiet. Orchard News: The paulownia has lost a few small branches in the storms, and one of the nectarines has lost the half dozen almost ripe fruit it had. I've propped up a branch of the laden old nectarine by the potager gate, as well as a branch on our Melrose apple. The Reine de Reinette apple has lost some fruit, but none of the other apples have and neither have the pears. I picked the last worthwhile sour cherries, so that's cherry season over for another year. I'll make a last precious batch of sour cherry syrup, and some pectin with the windfall apples. One of the cherry tomatoes has some colour, and they have survived the wild weather very well. The front of last year's compost bin has collapsed. The whole orchard was strewn with poplar leaves, which have come from the plantation by the river, a good 200 m away. Up at the house the c.2.5 m tall hollyhocks have all taken a dive and I have tied them up in preparation for the next round. When we pulled in to a motel to overnight in Moree, in central New South Wales, on 29 November 2012 we had no idea that the morning would reveal a vibrant café scene. Having travelled through Moree many times in the past we were dubious that this country town of not totally salubrious reputation would deliver anything worth reporting on. But these days it seems that there are a number of proper cafés in town, including one run by the Aboriginal community. 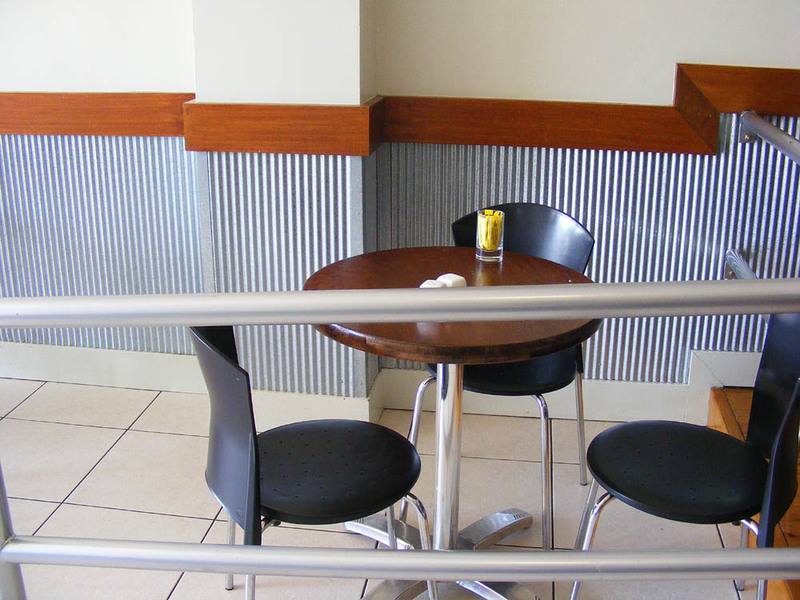 We checked the internet to find somewhere to have breakfast, and one place in particular stood out -- Café Omega. 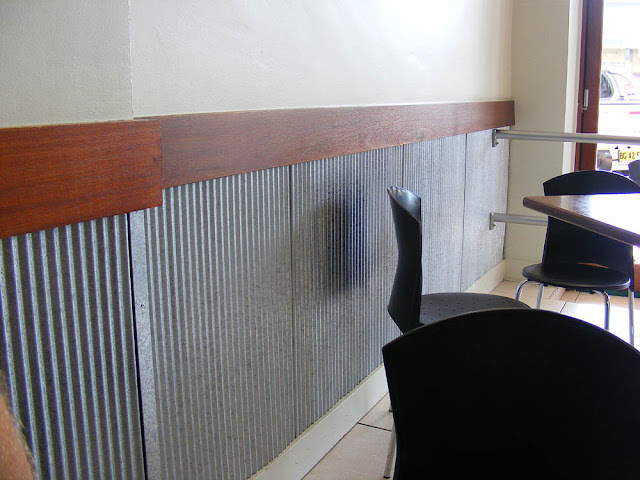 We really liked the nod to Australian heritage with the corrugated iron wainscoting. We were delighted to discover that Café Omega has been thoroughly and professionally conceived, from its layout to its menu. It is a striking step up from any of the other inland cafés we set foot in. For a start, the interior isn't a deafening cacophony of chairs scraping, screaming steam injectors and ever escalating conversation. Someone has thought about the acoustics and got it right. Second, it was obvious that a wide range of the community uses the place, from young women with children, older women with their mothers, and the most significant social shift of all in Australia, older men coming in for a coffee rather than repairing to the pub for a beer. Customer and work flows had been carefully thought out so that they worked smoothly and there was a central aisle to the L-shaped counter at the back. Beyond that were toilets and the terrace (which was too hot to consider using the day we were there). 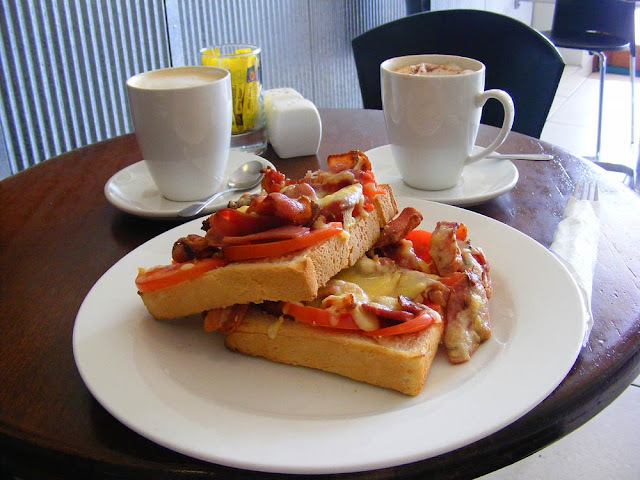 Grilled bacon, tomato and cheese strips on good chunky white bread with strong café latte. This was the only good bread experience I had in Australia. Bread in Australia is still generally ghastly, but the bacon seems now universally superb (a completely different product to when we left Australia in 1997). Finally, and most importantly, the food and the coffee were excellent, and came in reasonably priced, generous servings. The story of how this place came to be in this unlikely setting is told here, in a newspaper article. It must have been a tremendous risk at the time, to upstakes from more civilised parts and return to Moree with the idea of opening a café, but Charles Budway's vision has been achieved. We wish him bonne continuation. Ile de Ré Reflections: A view of harbourside buildings at Saint-Martin-de-Ré. Farming News: The wheat harvest must have begun, as the main thoroughfares of Preuilly have spilt red grain scattered all over them and there is a steady stream of trailers full of grain being towed to the silos in town. Weather News: Another big 3 am thunderstorm this morning, this time with less sound and light, but more lashing winds. Instead of being over in less than an hour, this one lasted at least 3 hours. I spoke to Charles, one of our wine growing friends yesterday, and he said they were very happy. They may have lost 50% of their harvest to hail in June, but now the weather is hot and it is raining at night with no hail. Perfect for swelling and ripening grapes. They want this weather to continue for another couple of months, and I don't suppose too many people would argue with them. Yesterday's Quiz: The answers are now added to yesterday's post. No one was awarded any points! 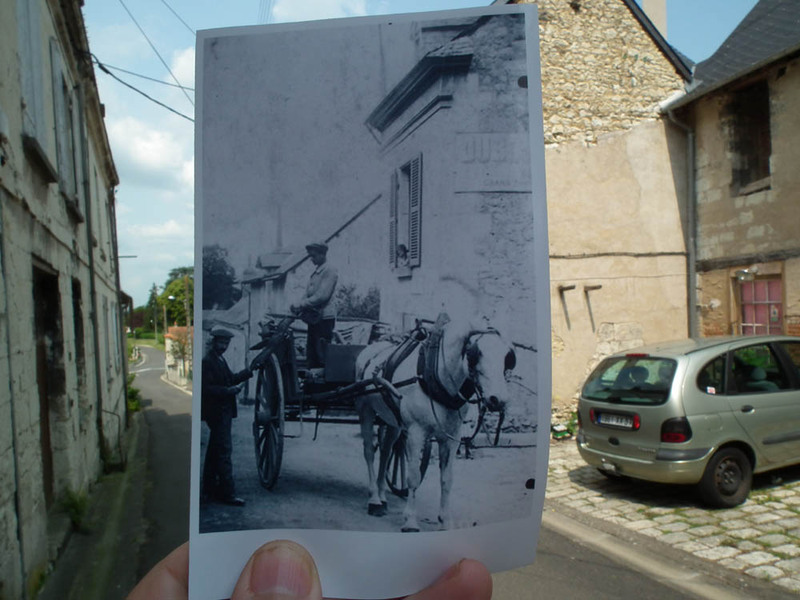 2 points if you can name the chateau where this photo was taken. 5 points if you can correctly and fully identify the group of objects on the table (material and place of origin will earn you points, as will any other interesting snippet of information regarding them). A la cuisine hier: Raspberry coulis. The raspberries came from our orchard neighbour, who picked them yesterday evening. They were over ripe and he made sure I knew I must cook them immediately. He said there was une livre in weight (a pound) in that old fashioned way they have here and they were €3. You do not ask for un demi-kilo of fruit at the market, that will not be understood, although you can say you will take cinq cents grammes. Liqueur de noix. This is what the Italians call nocino and many people know it by that name, not realising that the French make it too. In the Touraine the green walnuts are ready in mid to late July for making this magic elixir. This year I was nearly too late and some of the shells inside their green overcoats were a bit more woody than I would have liked. I haven't been able to make it since 2009 due to a lack of suitable walnuts. My original brew has almost run out. It was a traditional recipe but this year I have got a bit adventurous and the mix is 10 green walnuts, chopped (cue walnut bits whizzing all over the kitchen), a used vanilla bean, half a star anise, 5 mixed peppercorns, ½ cup orange syrup, ½ a cinnamon stick, ½ cup white vermouth, 1 cup vodka. Now it gets to sit on the bench festering in a jar for a couple of months. Theoretically it should be ready for Christmas, but if it is anything like the last lot it needs 3 years to really round out the flavours and be drinkable. It's useable after two, as an addition to other things for a hint of indefinable nut flavour in cakes and desserts or poured over icecream, but the real test is if you can drink it straight and genuinely enjoy it. 8 jars of Sour Cherry and Redcurrant Jelly. The combination is much nicer than either fruit on its own, a totally zingulatory experience (sorry non-anglophone readers -- that isn't a real word, I just made it up...) Think sour rainbow straps, sour worms or bonbons aigre-doux. Fried Rice. I often cook extra rice for a meal so that I have leftovers for fried rice the next day. By the way, has anyone noticed that ordinary long grain rice is almost impossible to get in France now? This is only a recent phenomena, of about 6 months. I can only easily get fragrant Thai and stupid parcooked long grain (what is the point, why is it yellow and why does it take the same amount of time to cook as regular rice?). Basmati is getting less easy to obtain. When I can get ordinary long grain, it is different to what I used to get. The new rice doesn't look as good, is fatter, seems to be more fragile both cooked and raw and breaks up easily. Does anyone know what is going on? Orchard News: Pears are looking good and some nectarines will soon be ripe. The tomatoes all have fruit (still totally green) but we clearly aren't going to get any zucchini or aubergines. A badger (I presume) has dug out a Red-tailed Bumble Bee Bombus lapidarius nest in the ground by a fence post. There is a neat hole about 30 cm deep and 20 cm in diameter, with a number of dead bees at the bottom, and some more bodies in the excavation material. The nest is still clearly operating at some level though, as half a dozen bees entered and left by two different entrances as I watched. Weather News: There was a tremendous thunderstorm at 3 am this morning. The booming and banging and brilliant flashing was most impressive. When I went to buy bread this morning though the baker had been alarmed by the ferocity of it all and had not switched his ovens on, in case there was a power surge that blew everything up, so there will be no bread until lunchtime. Our dishwasher has had one of its periodic flashing lights conniptions, so I'm guessing that was the storm. Quiz Answers: The chateau is Azay-le-Rideau, in one of the downstairs rooms decorated to acknowledge the Biencourt family occupancy. The objects on the table are Imari ware porcelain bowls imported to France by the French East India Company from China in the 18th century. Imari is a Japanese ceramic style from the 17th century, later copied by the Chinese for the export market and also copied by European manufactures in both porcelain and stoneware. These 5 bowls were purchased at auction last year in Tours from the descendents of the Biencourt family for €2200. 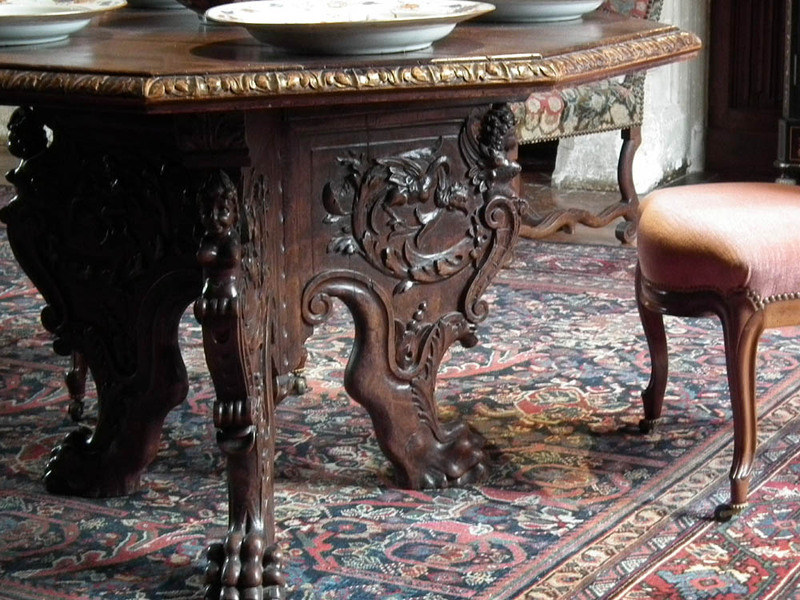 They are not perfect, having a few chips, but they are nice objects with a real connection to the chateau. No one really even got close, although chm's guess that they might be stoneware (faïence) was good thinking. So, no points to anyone. Better luck next time! 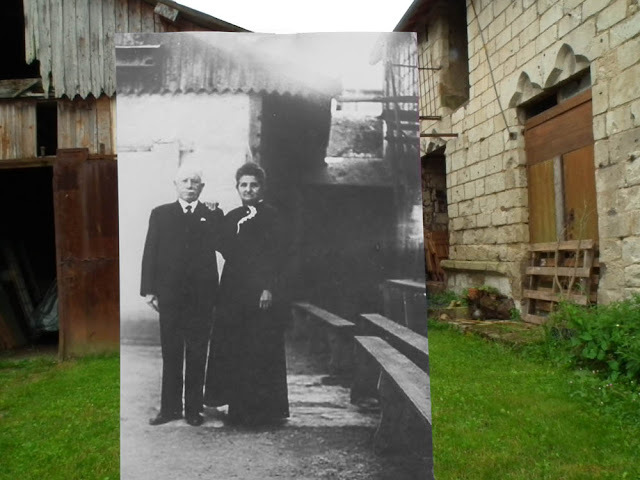 This is Désiré Poupineau and Aimée Bardon photographed in our/their backyard on 12 April 1939 on the occasion of their grand-daughter's wedding. Lecture: As part of the Archaeology Festival de la trace aux gestes there will be a lecture on the livres de beurre ('pounds of butter') stone tools produced in le Grand Pressigny area 5500 years ago to make very big flint blades. Tuesday 6 August at 6 pm in the Salle des Fêtes in Preuilly, free (in French). 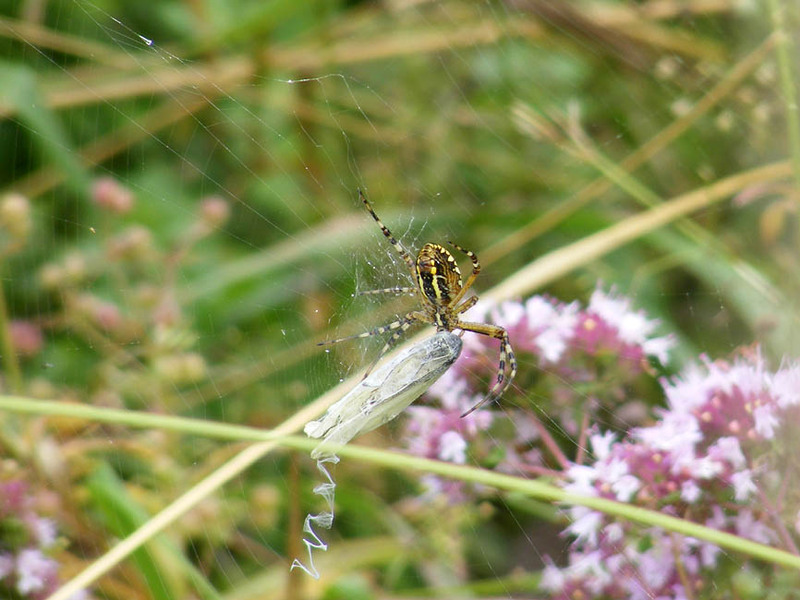 These female Wasp Spiders were all photographed in late July last year on a roadside between Preuilly-sur-Claise and Le Petit Pressigny . 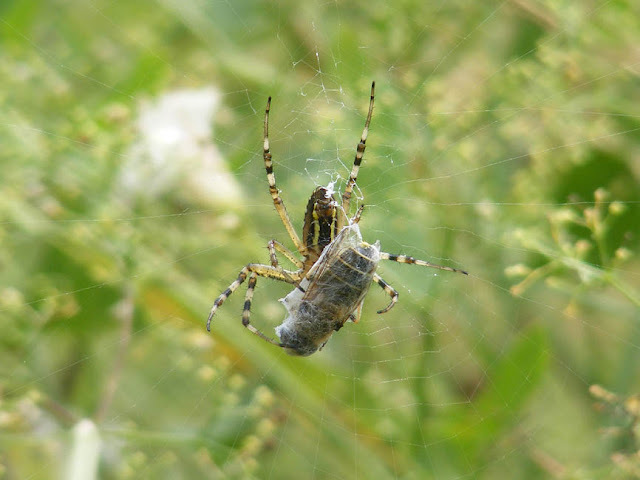 The spiders were only a couple of metres apart and each had captured a different insect. Lunch is a white butterfly. Party Report: Simon's birthday party went off very pleasantly and we were able to sit outside. This is a direct consequence of Simon and I getting soaked in the hammering rain that fell during the afternoon, putting the tent up. 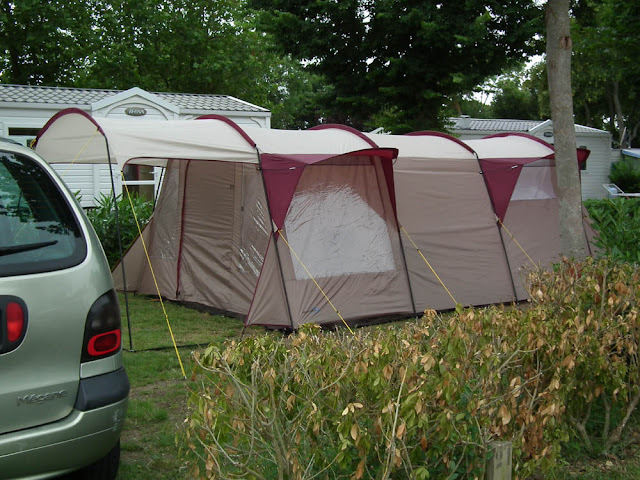 Naturally, after that the weather cleared up and when they arrived the guests moved the chairs out of the tent and onto the driveway. It worked surprisingly well. We put the food on a trestle table in the garage doorway, taking care to suspend a tarp over the top as we have nesting swallows. Many thanks to the cake bakers, salad and dip makers and beer connoisseurs who helped with the provisioning. And what's for lunch? Leftover salad and chicken of course! One of the most beautiful and peaceful spots in the forest is also one of the most moving. Today home to a wonderful selection of wildflowers and forest glade dwelling insects which draws me to it at least once a year, it is also the final resting place of 4 Resistance fighters. 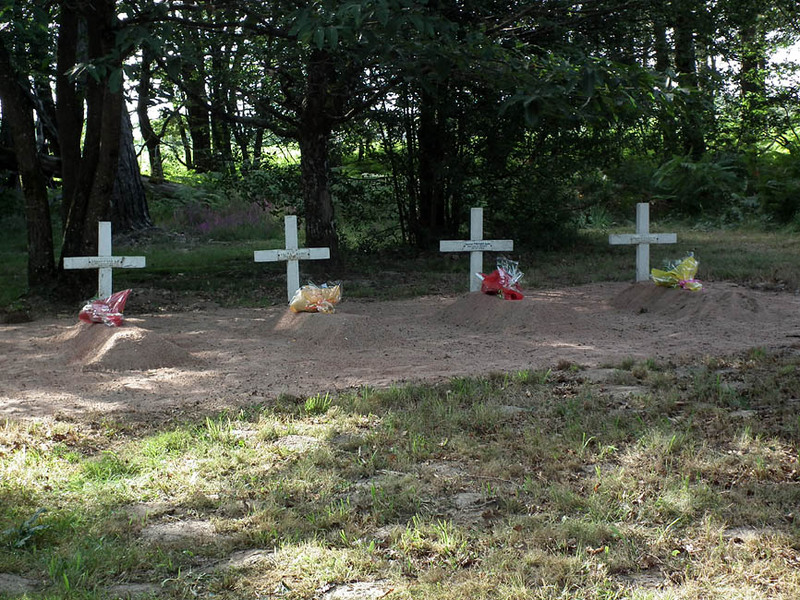 Four graves in the forest. We wrote about the annual memorial service last year. 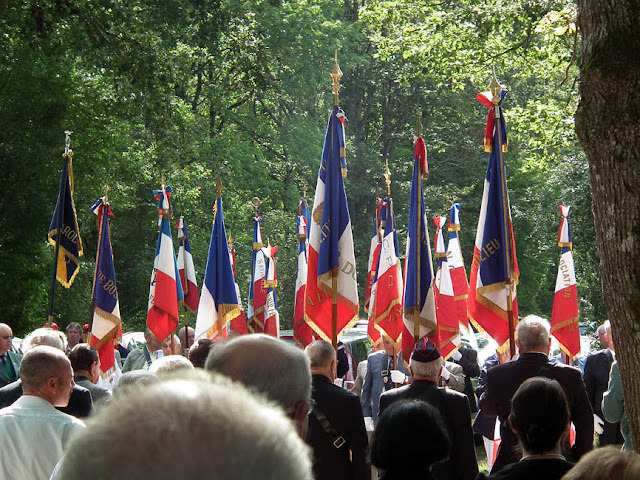 It's the anniversary of the events again, and as our next door neighbour's gardener said to me, la guerre n'a pas dit au revoir. So I thought it was a good moment to show some more photos. The standards of the local returned services leagues. Hummous - Bill is making his special version and bringing crudités. Lettuce - Tim is bringing some of his superb homegrown. Tomatoes - a selection of cherry types from the supermarket. Melon - from the market, guaranteed ripe for today by the stallholder. Flat breads - Simon is planning to make them today. Rhubarb and Cinnamon Cake - Antoinette is baking one to our friend Helen's recipe. Almond based cake - Elizabeth is baking something suitable for coeliacs. To the casual observer Small Scabious Scabiosa columbaria and Field Scabious Knautia arvensis appear to be identical. What's more, here in the Touraine, at any rate, they grow side by side, so on some sites you really do have to check every plant to know what you've got. 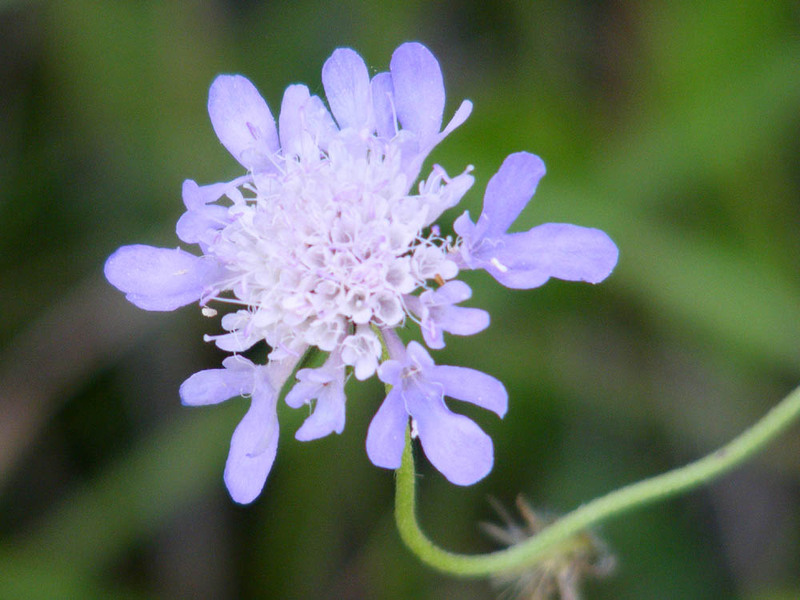 My observation is that Field Scabious is by far the more common species, probably at the level of about 100 to 1. 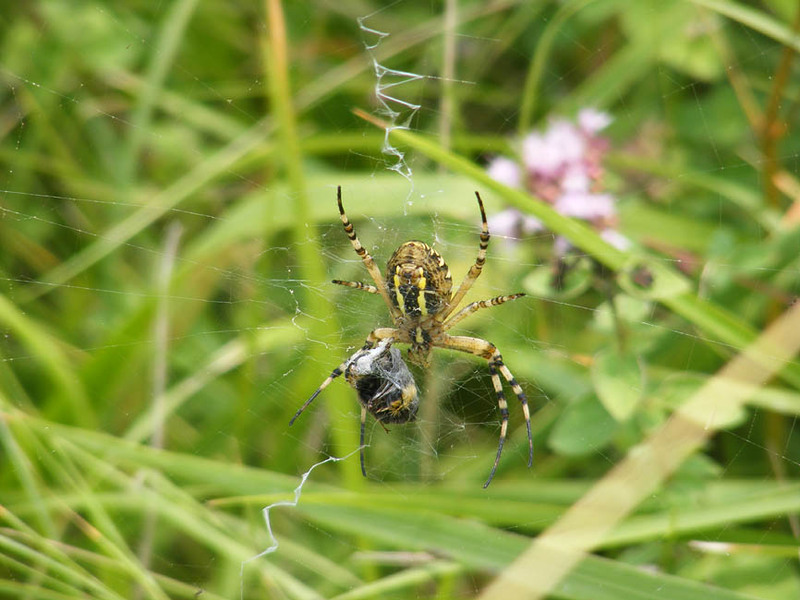 Both are very popular with nectar feeding insects - beetles, flies and leps especially. They grow in amongst the rank natural grassland. Field Scabious is not choosy about soil type, so long as the site is dry, but Small Scabious likes limestone 'underfoot'. Both are in flower from July to September, and both have pale lilac to lavender flower heads. Fortunately there are a couple of really easy ways to tell the two species apart if you take the time to look. 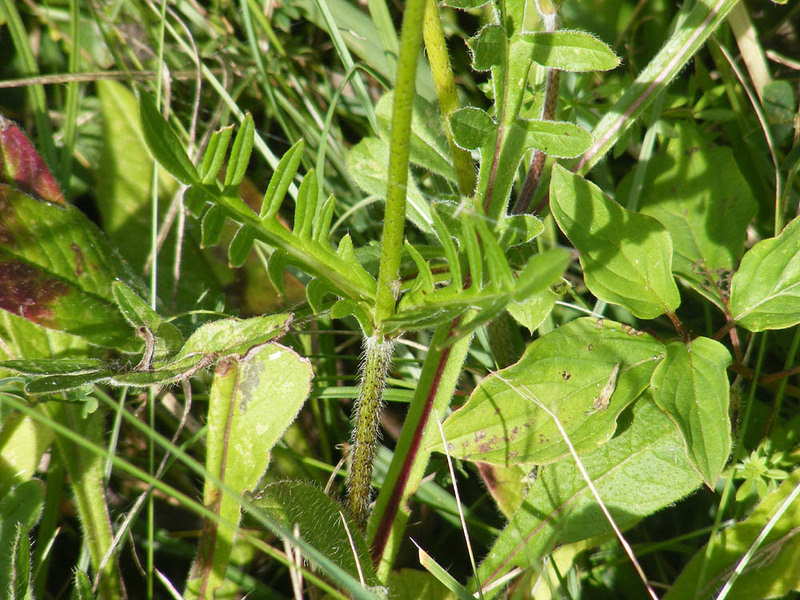 stem leaves with fine rather soft lobes - Small; stem leaves rough, rather stiff and with thick toothy lobes - Field. individual flowers with 5 lobes - Small; individual flowers with 4 lobes - Field. 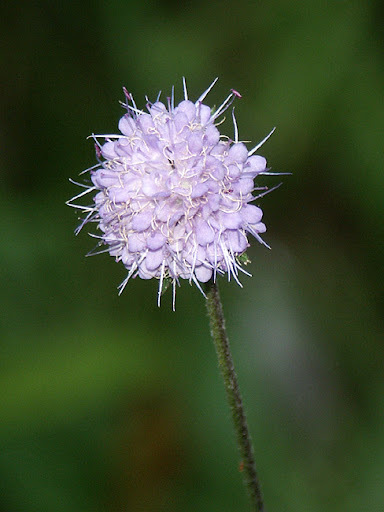 Additionally, the basal leaves (often hidden in the surrounding long grass) are divided and end in a spoon shaped lobe for the Small Scabious, but are pointed and undivided for the Field Scabious. 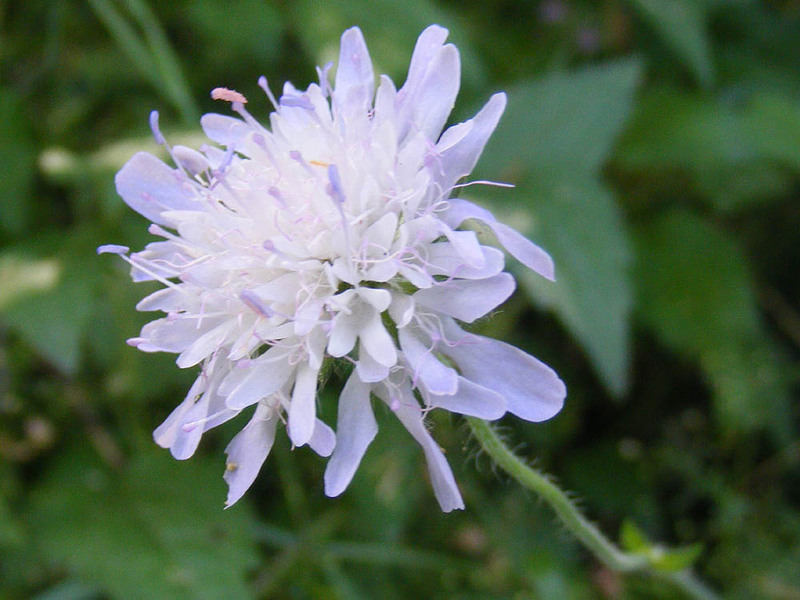 Small Scabious is a generally more delicate plant, with slightly smaller flower heads and finer stems and leaves. 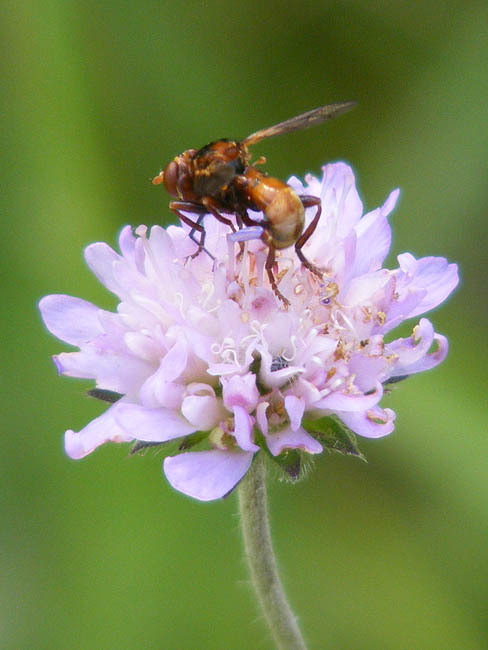 Don't confuse with Devils-bit Scabious Succisa pratensis, which has evenly sized flowers and undivided stem leaves. 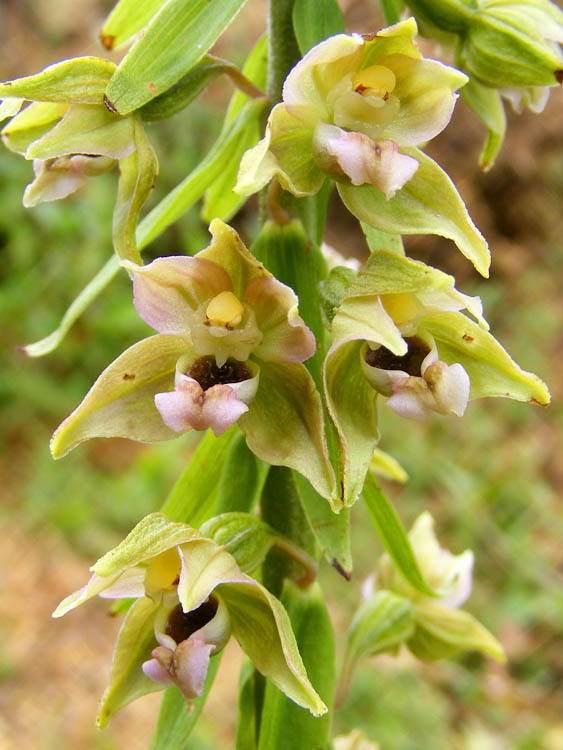 New Orchard Orchid: Meet the newest member of the Orchard Orchid Team -- the Broad-leafed Helleborine Epipactis helleborine. They have a reputation for turning up out of the blue in all sorts of places, even quite urban environments. A la cuisine hier: Limoncello, Lemon and Blueberry Cloud Cake -- wowee! What a taste sensation! It would adapt well to being GF and is not dissimilar to my Chocolate Chestnut Soufflé Cake, but somewhat less trouble and better behaved. Blueberries and citrus make a great combo. The remaining 800 g of blueberries from my little pick-your-own outing are now in the freezer, awaiting further culinary adventures. 1.6 l of sour cherry / redcurrant juice is macerating in the fridge with an equal quantity of sugar for a couple of days, prior to being boiled up to jam temperature. Tomates farcies (Stuffed Tomatoes) -- a classic French summer dish. I also stuffed some large button mushrooms and made some meat balls, all cooked together in the oven while I slow roasted a few tomatoes. I bought the mushrooms from the Dutch guy at Loches market who grows button and oyster mushrooms in a cave. So much better quality than supermarket mushrooms. 32 chicken thighs are swimming in an olive oil, lemon juice and cumin based marinade, ready for tomorrow's birthday party. The indoor stadium, where in his misspent youth Simon saw Iron Maiden, Deep Purple, Joe Cocker and Jon English, and worked on a production of Aida. 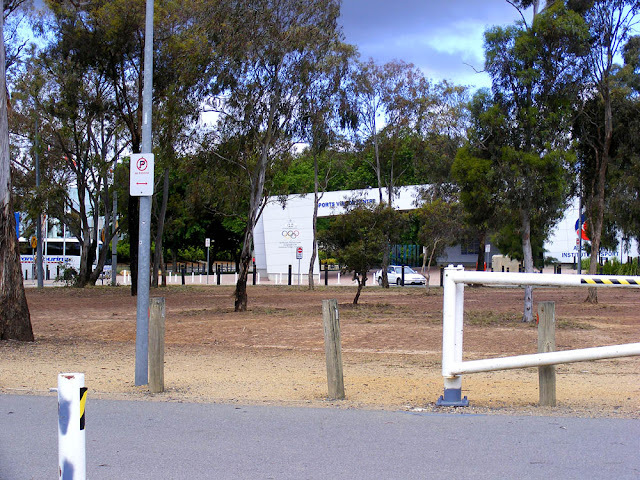 While in Canberra last year we took advantage of being in the same town as the Australian Institute of Sport. Although the Institute's focus is training elite athletes, members of the public can join the AIS for AUD$63 a month and attend exercise classes and use the gym and swimming pool. We chose to do daily morning aqua aerobics classes in the indoor 25m shallow pool. It was a friendly and welcoming group. For us hardy European types the water was heated to scarcely lower than bath temperature, but all the locals were complaining about how cold it was. I reckon the water temperature was at least 28°C. The pool is 1.1m deep for its entire length, and Simon found he was continually scraping his knees. I had no such problems, but we both struggled with the levels of co-ordination required for the Wednesday aqua Zumba class. 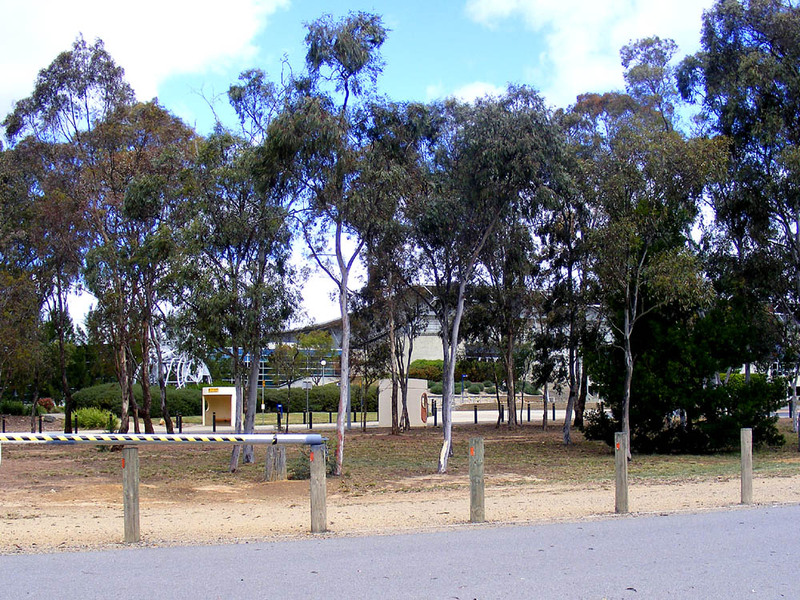 The swim centre is the building to the left. The facilities at the AIS are excellent, as you would expect from an institution that receives much of the AUD$170M annual government funding for elite sport in Australia. Politicians perceive elite sporting achievement as very important to Australians, and as a result it is generously supported -- some would say at the expense of other less glamorous but ultimately more significant things (such as hospitals or even sport at a school and community level). Guided Walk: As part of the Archaeology Festival de la trace aux gestes there is a guided visit on Thursday 25 July to the Abbey of Saint Pierre in Preuilly (bring binoculars for looking at the capitals if you can) followed by a walking tour of the town to see various historic buildings and learn about their past. After the walk you can also attend a flint knapping demonstration at the museum, very educational and suitable for young and old. (Note: the commentary will be in French, but the demonstration and walk are both worth doing even if you don't understand the language, so long as you are interested in history, architecture and pre-history.) Meet at the Maison de Pays (Tourist Office) in Preuilly at 3 pm. 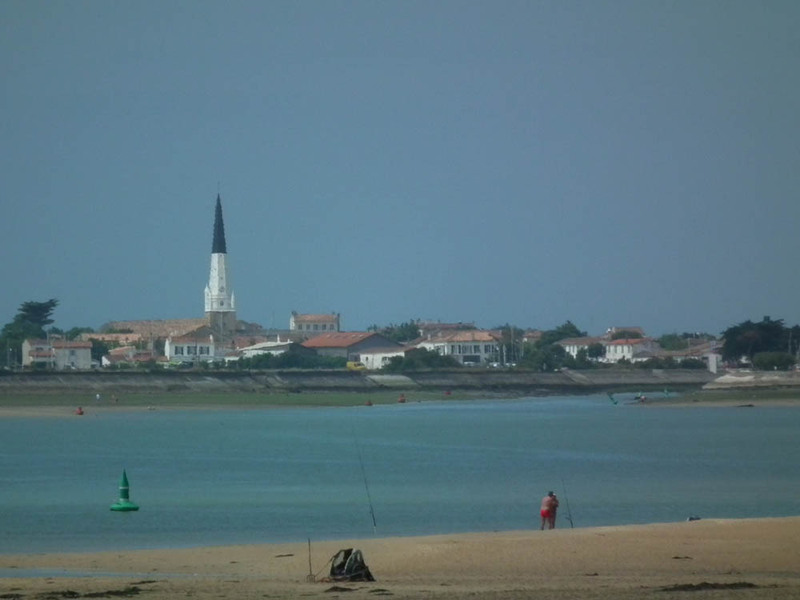 Ile de Ré Reflections: A view of Ars-en-Ré. A la cuisine hier: 22 Blueberry Muffins baked, using some of the blueberries I picked the other day in the Sologne when Antoinette, Pauline and I went on a blueberry picking expedition after Walt blogged about it. All the blueberries disobligingly sank to the bottom, despite me following the instructions to coat them in a little flour to prevent this happening. A kilo each of sour cherries and redcurrants boiled up together and strained through the jelly bag, ready to make sharp spicy ruby coloured jelly which can be used in both sweet and savoury dishes. Delicious with cheese and strong flavoured cold meats, but also spread between sponge cakes or used like jam on toast. Swimming: The difference in the weather between yesterday and the day before was particularly marked. Friday it rained all morning, at times quite heavily. It wasn't really cold, but only the diehards were at the pool and we swam happily through the rain, with Laurent directing poolside under a large umbrella. Yesterday I reckon it had already hit 30° C by the time we arrived at the pool at 10.30 am. There were probably more people than I've seen there before enjoying the water, but we still got a good swim in, dodging the occasional child on a floating mat or thrashing their way to daddy. 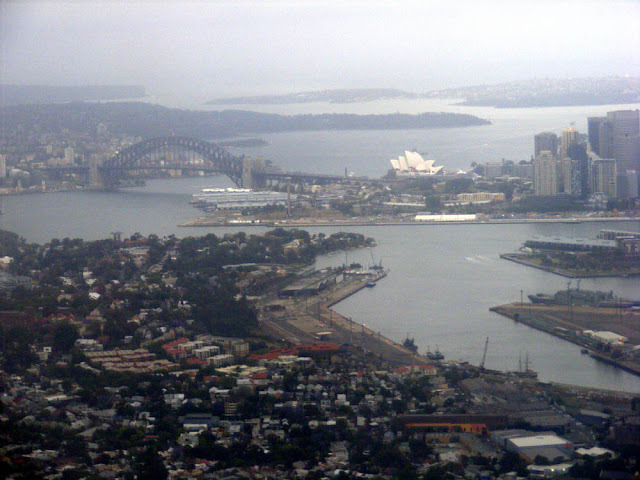 Sydney Harbour, photographed from the plane coming in to Kingsford Smith airport. Ile de Ré Reflections: Our tent on its first outing, to the municipal camp ground in Saint-Martin-de-Ré. Yesterday's Social Whirl: In the morning swimming with Huub, Ingrid, Anneloes, Tristan, Laurent et al. Late afternoon fellow blogger Jean and a friend dropped in. In the evening we went over to Martin's place for apéro (which of course stretched into a barbecue dinner, and we were joined by his arborist brother Antoine, sister-in-law Brigitte and their neighbours). Much deep discussion about life the universe and everything over the rosé. There's been a lot of fuss made in the international English language newspapers recently, claiming that the French finally have a word for 'French kissing'. The French themselves are quite surprised to hear this, since they've been using the verb galocher in the sense of 'snogging' or 'sucking face' for decades. The origins of the expression probably come from associating the slurping, squelching sounds made when walking in galoshes to that of passionate kissing with tongues. If you want to be more elegant in your language in French you use embrasser. My reading suggests that what seems to have changed is that galocher has appeared for the first time this year in the most widely used abridged dictionary, le Petit Robert. It's been in the big Robert for years. 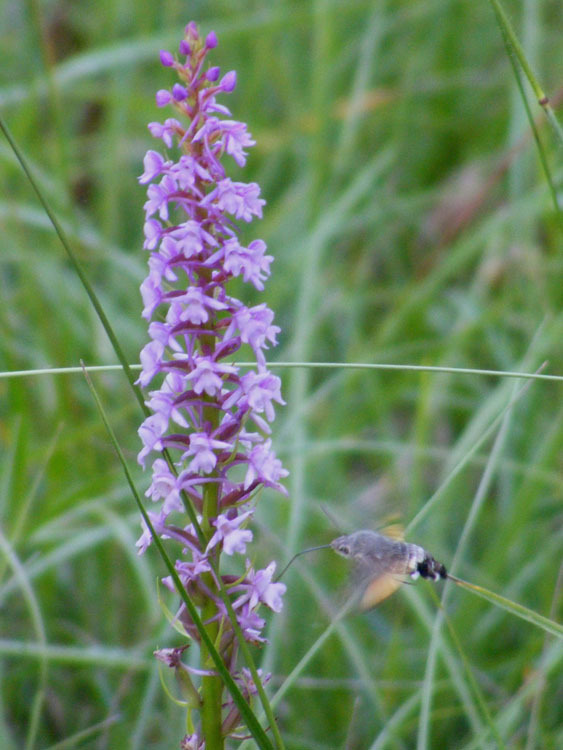 Anyway, all that is just an excuse on my part to post some photos of a Hummingbird Hawk Moth Macroglossum stellatarum giving some tongue to a Fragrant Orchid Gymnadenia conopsea. 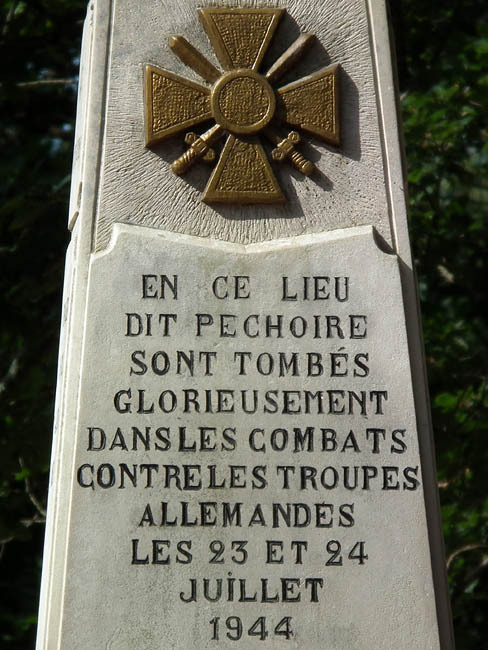 These photos were taken on 30 June near the Mary Chapel in the Bois des Prêtres at Boussay. In this photo you can see that the proboscis is actually in two parts. Fragrant Orchids have long spurs full of nectar and give off a scent to attract long tongued insects to them for pollination. Studies have shown that the Hummingbird Hawk Moth is one of the most important pollinators of Fragrant Orchids and that the orchid is very successful at attracting pollinators, with three quarters of flowers being fertilised and setting seed. It is certainly a species that, although local and restricted to certain sites, is thriving in the Val de la Claise Tourangelle. 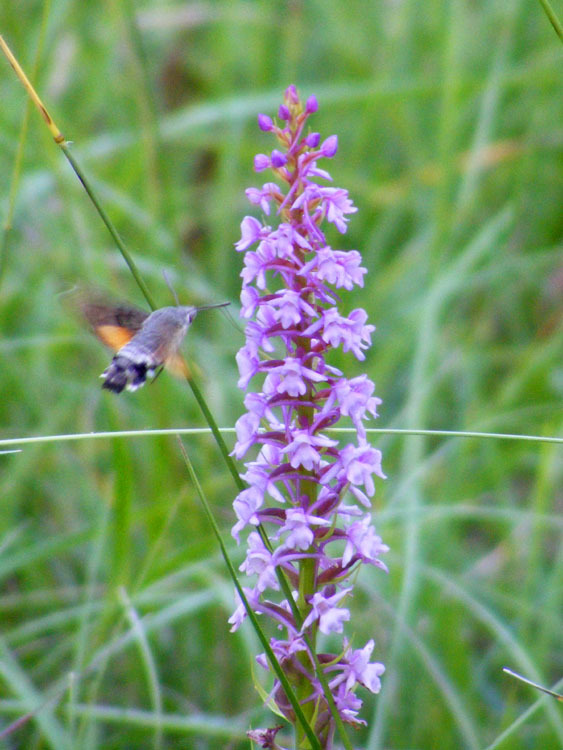 Mind you, this moth wasn't getting close enough to pollinate the flowers. Its tongue is longer than the flower's spur, so it doesn't have to land and poke its face into the flower. 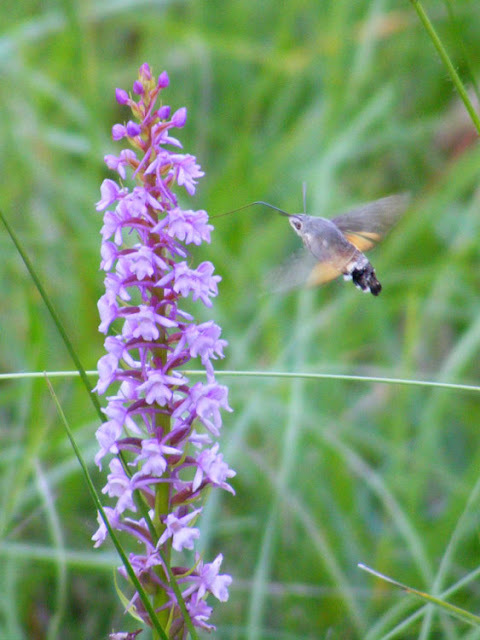 I suspect this is the reason that another, night flying hawk moth is the top pollinator, with the day flying Hummingbirds coming in second. Technically the 'tongue' is a proboscis, made up of a pair of gutter shaped parts which link together to make a tube. The moth expands and contracts a sac in its head to create suction and nectar is drawn up the tube. The precision they achieve with controlling the long extended tongue is mind blowing. When not in use it coils up neatly and sits tucked into a slot under the moth's 'chin'. Weather News: After a couple of weeks of non-stop dry sunny hot weather it at last built up into a terrific thunderstorm last night. Lots of thunder and lightning, but best of all, a significant downpour which will provide much needed refreshment to the land. It's amazing after all the rain we've had in the first half of the year how quickly the rivers have come down to their normal summer levels with this recent relatively short dry spell. Harlequin Ladybirds Harmonia axyridis arrived some years ago in Europe, introduced to greenhouses to control aphids. They are native to central Asia. Inevitably they escaped into the wild, and ever since scientists have been observing and monitoring the effect on native ladybird species. They are bigger and more aggressively voracious than any of the native species here, and it was feared that they would out-compete the natives easily. However, the situation seems to be more complicated than that. Photo courtesy of Tim at Aigronne Valley Wildlife. New research from Germany shows that the Harlequins carry a parasite. They are not particularly bothered by this freeloader, which seems to be dormant when in a Harlequin, but becomes active when ingested by other species of ladybird, who are killed by it. The scientist who conducted the research likens the situation to the European settlement of the New World, when diseases that the colonists survived proved to be deadly to the indigenous population. The parasite lives in the Harlequins' haemolymph ('blood'). Their blood also carries a toxin called harmonine, the function of which is to poison any creature that eats the Harlequins' eggs. Previously it was thought that this was what was killing the natives, but it turns out that 7-spot Ladybirds Coccinella septempunctata, at least, are immune to harmonine. Further examination revealed the real culprit -- a tiny single celled microsporidian parasite. Ladybird species commonly eat one another's eggs and larvae, so the parasite could be transfered very easily from one species to another. It could also be transfered by parasitic wasps, which lay their eggs in a variety of ladybird species. A rather typical adult Harlequin Ladybird, although they can be difficult to identify as they exhibit many different pattern combinations. One sure way of identifying them is their brown legs. The native species of similar size all have black legs. However, other scientists note that the Harlequin's success is at least partly due to the fact it is more resistant to fungal diseases than the native species. They also note that one species of native ladybird has weathered the invasion without too much concern, whilst others are in severe decline. 7-spot Ladybirds rarely eat Harlequin eggs and this may be protecting their numbers in the wild. 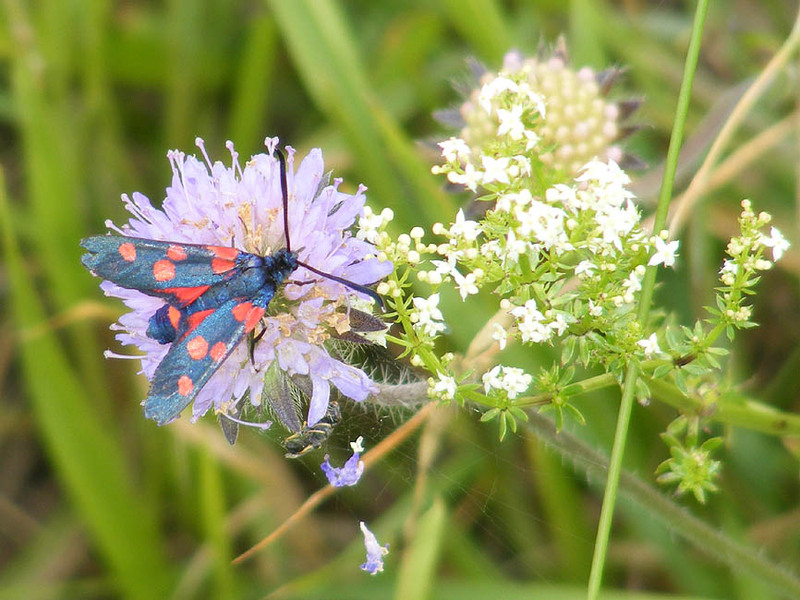 Certainly here in the Touraine the 7-spot is the dominant species. Harlequins are not seen that often (except apparently in the Aigronne Valley...) and numbers of 2-spots Adalia bipuntata remain good. I don't know what the situation with other species is. The research has implications for bumble bee decline in North America, where habitat loss, climate change and pesticide use don't quite explain the sudden and extreme reduction in numbers of certain species. An introduced microsporidian is suspected here too. 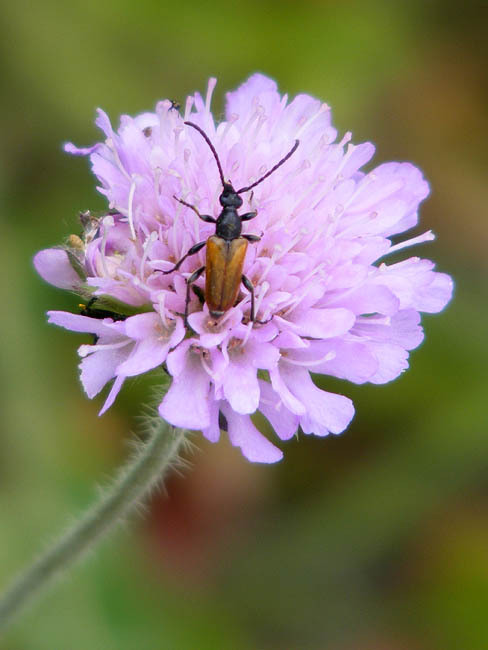 See also Ed Yong's article in Nature for an overview of the research, and Tim's post on Aigronne Valley Wildlife for some history and great pictures of some of the different patterns the little blighters come in. A la cuisine hier: Simon made another yellow cherry based Asian sauce, this time a hoisin like concoction. He can't wait to try it as a marinade on beef. I'd better keep the supply of cherries up to him as he's really on a roll with these sauces. It's July and the currants have hit the market stalls. 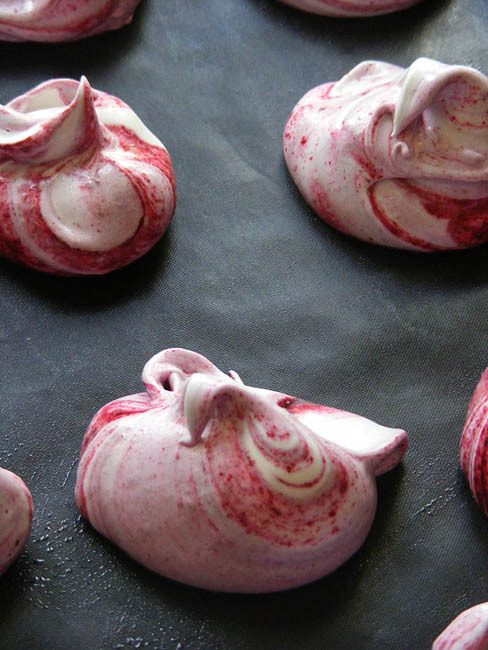 Last year I came across a Hugh Fearnley-Whittingstall recipe for Blackcurrant Ripple Meringues. I happened to have all the ingredients in the house so away I went, doubling the meringues because I had 4 egg whites hanging about the fridge waiting for a purpose in life. The meringues are gorgeous and the whole dish very easy. Strip the blackcurrants from their stems and put into a small saucepan with a tablespoon of water. Bring to a simmer and cook until they burst (5 - 10 minutes). 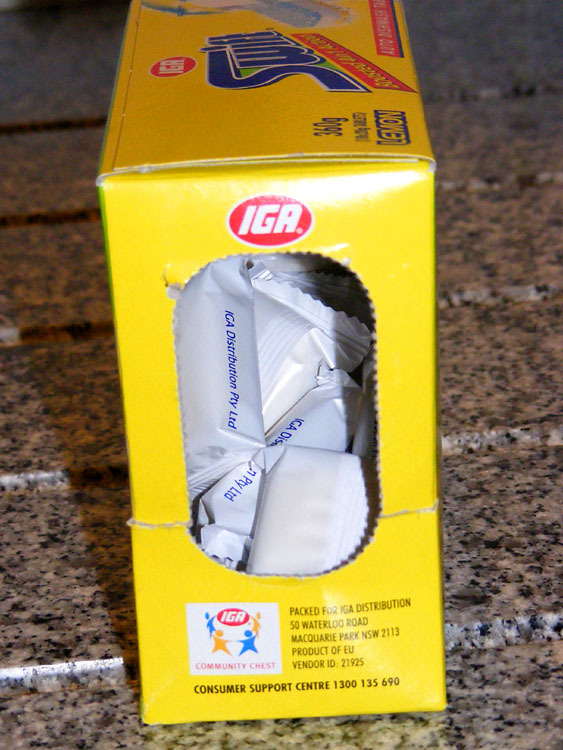 Rub through a sieve to create a coulis and stir in the icing sugar. 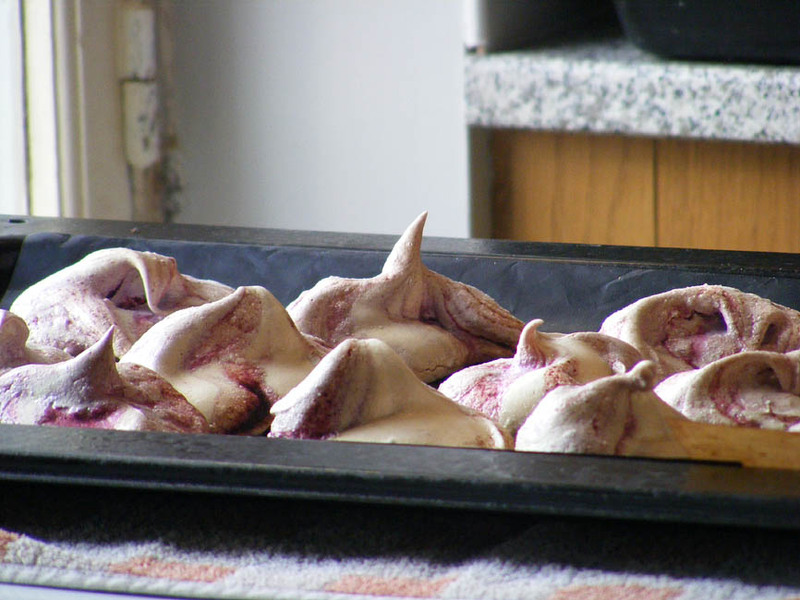 Line baking trays with non-stick baking sheets - you need enough space for 18 meringues. Beat the egg whites until thick, then gradually add the 200 g castor sugar and beat until the stiff peak stage. Add several spoonfuls of the cooled fruit puree to the meringue and gently swirl about until you have a pleasing streaky pattern. Spoon 18 dollops on to the trays, making sure they are pulled into attractive pointy bits. Cook for 1 hour 30 minutes, then remove and cool on the trays. Loosen the cream with the remaining tablespoon of the castor sugar and the creme de cassis, then whip to soft peaks. 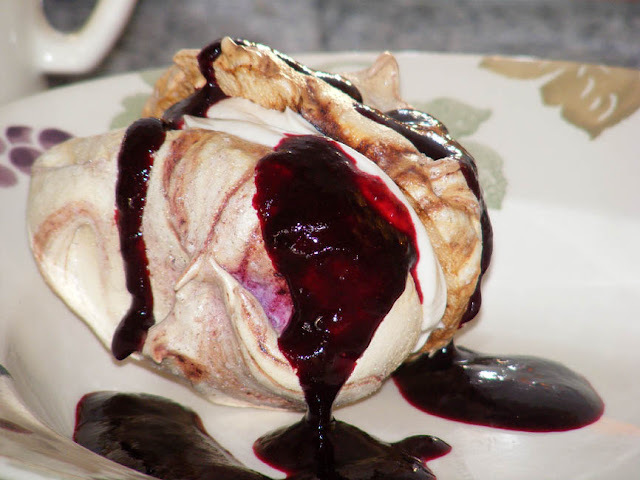 Sandwich pairs of meringues together with some cream and serve drizzled with the remaining blackcurrant coulis. Farming News: The first fields of sunflowers are out. Esca is a fungal disease that is hitting the Loire Valley vineyards hard. Many winemakers have lost thousands of vines over the past few years. There is no currently available effective treatment for the vines once they have the disease and it has the potential to turn into a crisis of Phylloxera scale proportions (when at the end of the 19th century a root aphid which introduced a fungal disease nearly wiped out the French wine industry). Part of the problem is that the disease is actually caused by a group of closely related fungi. 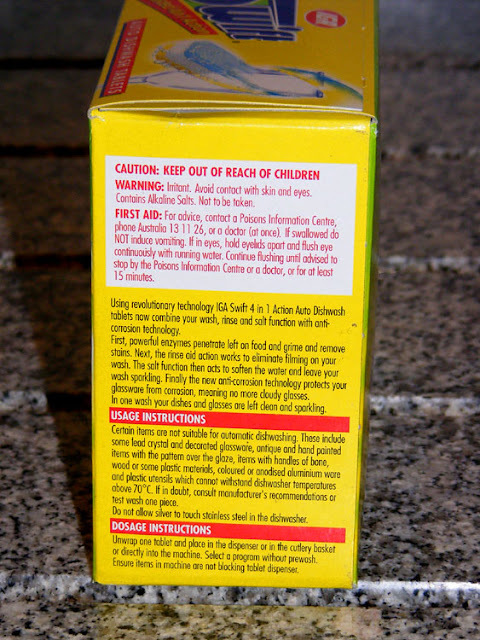 The only treatment that kills them, sodium arsenite, is a known carcinogen and so toxic to all living things it is too hazardous to use and has been banned. At present it isn't even sure how the fungi are transmitted -- whether they are soil, water or air borne. However their means of transport, they enter the plant at the level of the graft, and affect the root stock. The vine reacts by blocking off its vascular system, but the fungi propogate rapidly and very quickly the plant kills itself by blocking so many of its sap runs that it starves. Typically the leaves turn yellow with a characteristic pattern. 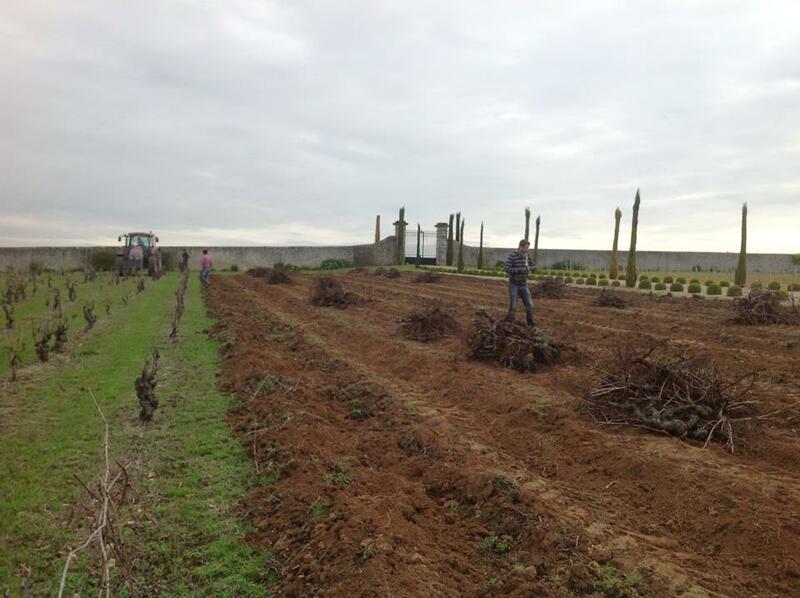 Removal of affected 35 year old vines in Vouvray. The remains were burnt, but these vines were only middle aged, so it is a blow to have to replace them. Photo courtesy of Chateau Gaudrelle. 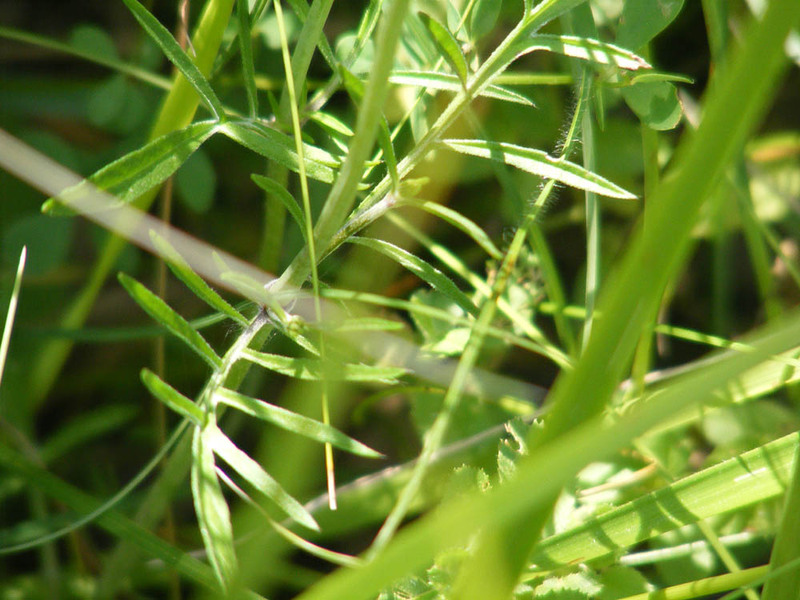 The French National Agronomy Research Institute (INRA) is working on finding a solution, and has clarified what the symptoms are and identified the specific organisms concerned, but a cure is proving elusive. At the moment, it seems that inoculation of root stock with the oomycete Pythium oligandrum may have promise. This organism is a parasite of many harmful fungi as well other undesirables such as Botrytis and Phytopthora. 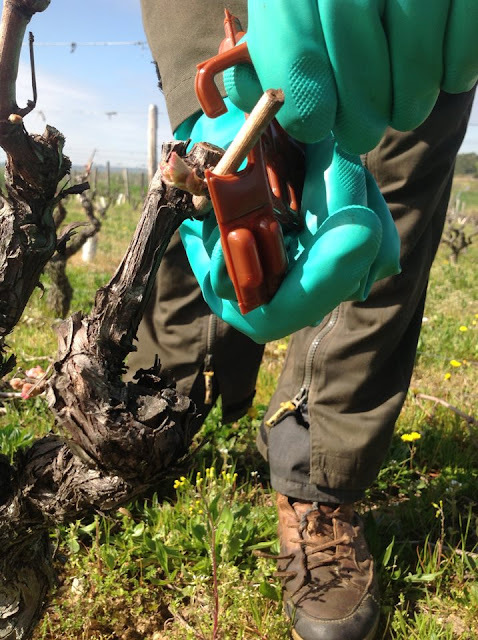 It not only directly parasitises the fungi but causes the vines to react by stimulating healthy growth and chemicals to defend against pathogens. New certified clean plants ready to restock the vineyard. Photo courtesy of Chateau Gaudrelle. In the meantime, winemakers are turning to all sorts of alternatives. 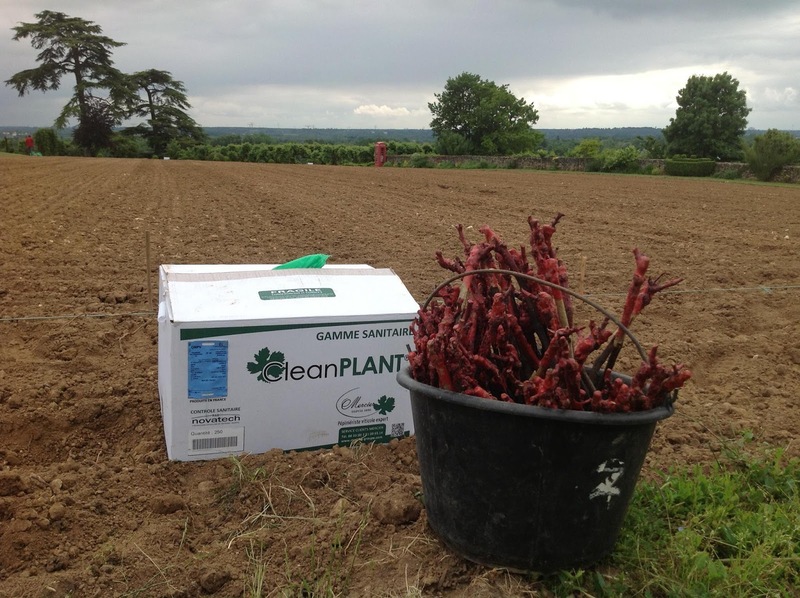 Some are planting wild leeks amongst the vines, in the belief that their associated mycorhiza can combat the esca. 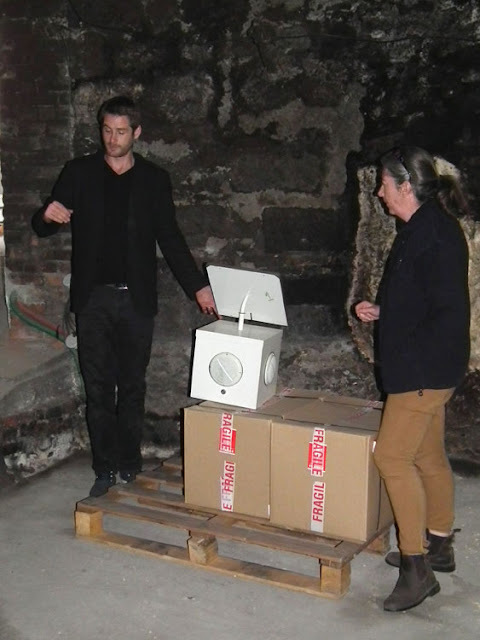 Others are 'playing music' to the vines, using devices which send out periodic audible tone patterns which the inventors claim disrupt the proteins of the esca fungi and prevent them from growing. My reading suggests that soil conditions play a part, and parcels with residual herbicides or vines that have had their soil microbia disrupted are particularly at risk. Another risk factor that most people agree on is when a warm wet spring is followed by a dry summer. This type of weather pattern always seems to cause a serious outbreak of esca. Once the disease is detected in a parcel of vines, those vines and their infrastructure are removed and new vines from a nursery that can be trusted to supply clean stock are replanted. The disease can take hold and kill very rapidly (within months) or the vines can linger on for several years with symptoms including yellowing leaves and slow maturing grapes. Fête Nationale: Simon went to the celebrations in Preuilly, held on Saturday night, and really enjoyed himself so he made a video. There were fire eating zulu drummers, loud, generous and colourful feu d'artifice and the traditional bal populaire, at which the Madison was danced to Just a Gigolo well into the night. 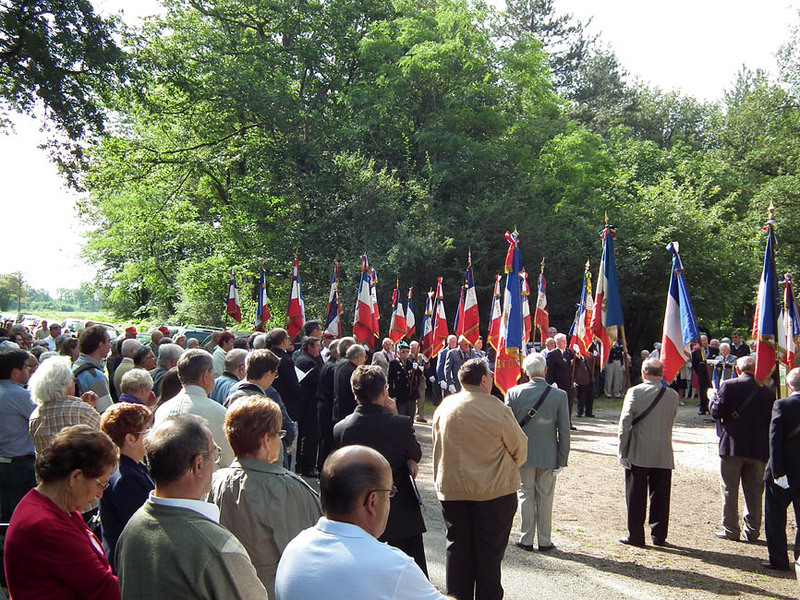 And in case you are wondering, only anglos refer to Bastille Day, and lots of communes hold their 14 juillet Fête nationale celebrations on the eve. A la cuisine hier: The sour cherry syrup has now infused sufficiently, so was strained and bottled, yielding 2 litres for adding to fizzy water, or perhaps instead of cassis for various kir style drinks. The sour cherries macerating in sugar were also ready to have a bottle of cheap vodka tipped over them. They will sit in unsealed jars somewhere reasonably warm for a month to 'brew'. My friend Christine told me that in the old days they were sat out in the sun, although she has also been told by an old lady that the proper way to do it is to put them out in the moonlight. I picked 5.5 kg of sweet yellow cherries from the enormous tree on our orchard neighbours' plot. We ran into her the other day on the way to the pool and she suggested I help myself, although warned me that they were full of asticots (maggots). It's true that some of the fruit had the tell tale shadow under the translucent skin that indicates it is infested with cherry fruit fly. However, most of them are pretty well perfect. I've set aside some to eat fresh and Simon has make an Asian sauce (basically plum sauce but made with yellow cherries instead of yellow plums). I'll take a small jar around to her in a few days. Even if she doesn't cook Chinese food, it will go well with cheese. Yellow cherries aren't grown commercially, but they are widely grown in gardens here. The theory is that the birds don't notice they are ripe and ignore them. I don't know what variety this one is. It turns butter yellow when ripe. Our yellow cherries are Coeur de Pigeon and Napoléon, both of which get a rosy blush when ripe, so the birds aren't fooled at all. They also ripen much earlier and it seems to me that this is the real key. Birds get an awful lot of early and mid-season cherries, but leave the late ones. I think they've got tired of cherries and have moved on to something else. Orchard News: A Marbled Fritillary Brenthis daphne spotted laying eggs on our tayberry. Their caterpillars eat brambles, so why not tayberries. This is a new record for the orchard, and somewhat of a surprise. This species seems to be only Fritillary butterfly doing well this year, and I have recorded it for the first time at one of my Chaumussay transects too (where it was not a surprise, but I just hadn't ever seen it there before). 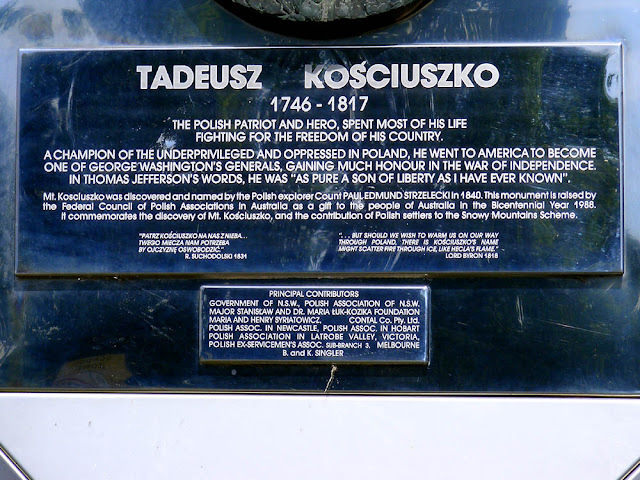 In a little park in Cooma there is a simple, modern memorial to the late 18th - early 19th century Polish patriot Tadeusz Kosciuszko. Cooma bills itself as the 'Capital of the Snowy Mountains' -- by virtue of it being the headquarters of the Snowy Mountains Scheme, even though it is actually on the Monaro High Plain, and not really in the mountains themselves. It's where teams of workers, many of them Polish immigrants, or those from other eastern European countries, came to work in the 1950s and 60s. 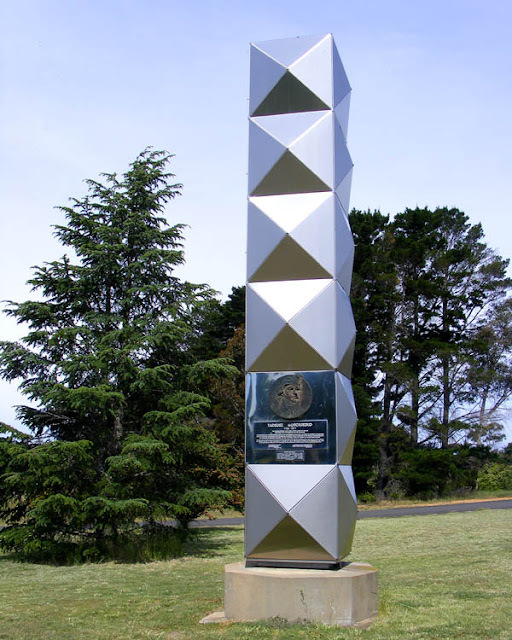 But there was already a Polish connection in this neck of the woods, as the explorer Paul Strzelecki had named Australia's highest mountain, in the heart of the Snowys, after one of his heroes. 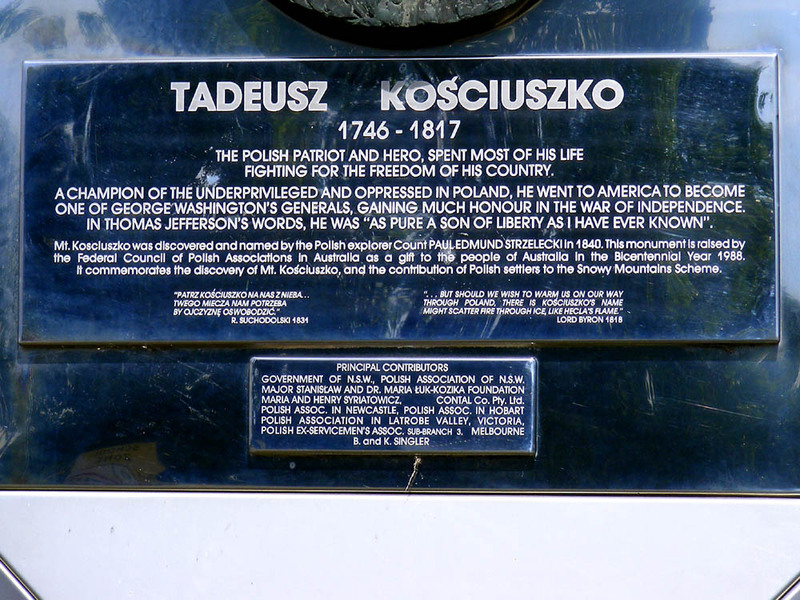 Most Australians couldn't tell you who Kosciuszko was, I suspect, and they certainly don't pronounce his name correctly. The mountain is 'kozzy-oss-koh' to Australians (whereas the Polish pronunciation is something like 'kosh-chyoosh-koh'. There is a Kosciuszko connection in France too -- he lived in France at various times in his life and there is a monument to him at Montigny-sur-Loing. Napoleon was one of the few people who did not unconditionally admire him, and instead despised him as a romantic fool. 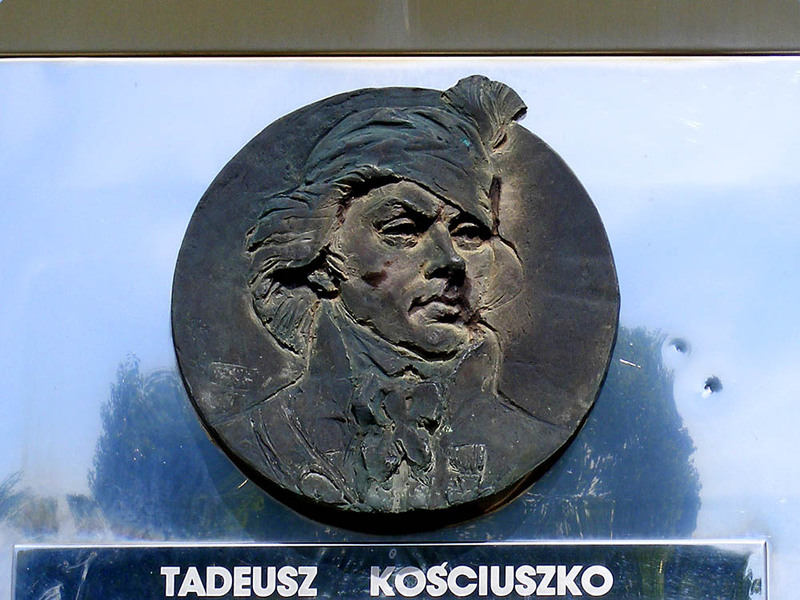 The name lives on here too, with our former Ecology Minister and close colleague of Nicolas Sarkozy, Nathalie Kosciuszko-Morizet, a descendent of Tadeusz Kosciuszko's brother. She is running for Mayor of Paris next year, against the impressive and popular Anne Hidalgo, the current Deputy Mayor. 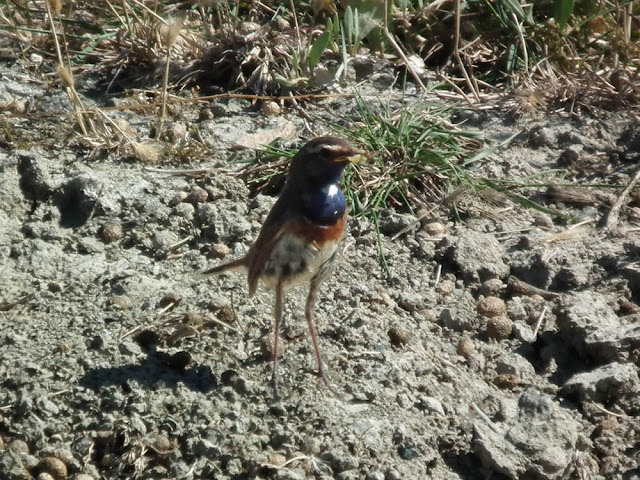 Ile de Ré Reflections - New Bird: The White-spotted Bluethroat is considered endangered in Europe, but on places like Ile de Ré, where we went camping recently, it is making an excellent recovery. The reason for this is salt. 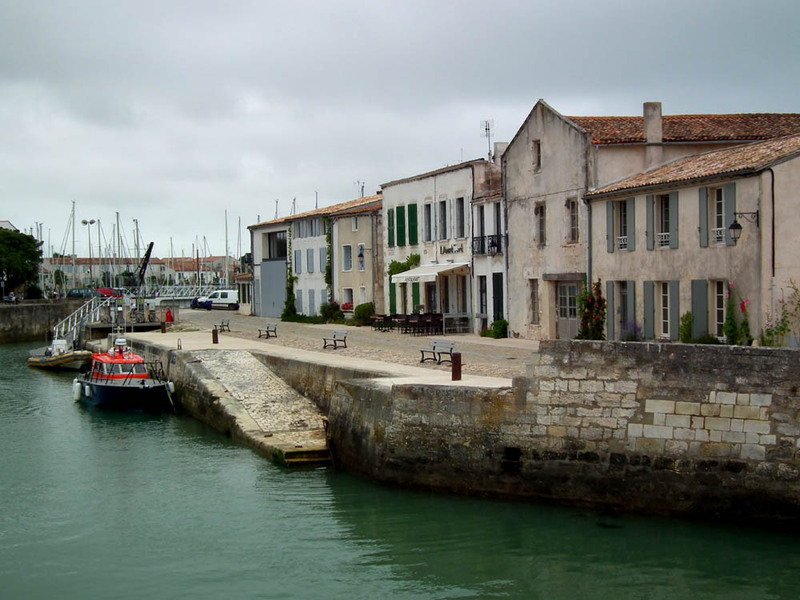 On Ile de Ré, sea salt is still produced in the traditional way, by evaporating shallow man made ponds of sea water until only the salt is left. Of course, producing the salt is a bit more technical than that, but it means that there is a landscape created and maintained in the salt marshes that really suits this pretty little bird's breeding requirements. We had never seen one before, but on a visit to the salt museum at Loix, we noticed a male hopping about on a bank just by the front door. Provide habitat with flowers for food, and suitable nesting and resting places. Acknowledge and value pollination services in the agricultural industry. Monitor pollinators using systematic, scientific methods. Reduce overall use of pesticides (insecticides, fungicides, herbicides) and fertilizers. Stupendous Orchard News! : Yesterday evening I mowed the potager for the first time this year. By some miracle I managed to miss by a whisker a large Epipactis orchid in bud that I have never before noticed. This is a new and completely unexpected species for the orchard. I assume it is going to turn out to be Mueller's Helleborine Epipactis muelleri, but it might be Broad-leafed Helleborine E. helleborine. I shall have to wait until the flowers open to be sure. That makes 6 species this year in the orchard. In Our Kitchen Yesterday: Tagliata, steak and salad with an Italian twist.